I have, at one time or another, both stayed up until and gotten up at every small hour of the morning. The former of the two – the staying up late – seems to happen, or has happened, mostly in relation to a deadline of some sort, be it one of school or a self-imposed project with a time constraint (e.g. a homemade birthday gift for an out-of-town friend). My times of getting up obscenely early, meanwhile, are more so associated with places I need to get to on time: to work to set up for a special event; to the airport for an early flight; to make it first in line for the walk-in clinic. Of the two possibilities – remaining up late or rising early – up late will always be my preference. The same goes for when it comes to deciding when to do my writing – this both despite and in spite of the less-than-celebrated status of the nighttime writer. There’s a certain esteem within the writing world associated with those who write in the morning compared to those who do so at night. This is further emphasized in those who get up very early – 4:00 or 5:00am – that 11:30pm/midnight/onward writers like myself never get to enjoy. Morning writers are viewed as go-getters. They’re said to be starting the day off right – using the best and freshest of their energy to be creative. They’re also are seen as sacrificing sleep and embracing the darkness of early morning in advance of a long day at work and/or with demanding children and spouses to live life the way a true artist should, i.e. in suffering. Morning writers are always legitimized by articles and blog posts about their exemplary time management. Their success, these pieces seem to imply, is all but assured one day if for no better reason than the earnestness of their devotion and self-denial. They are regularly reminded of and equated to famous writers, artists, inventors, thinkers, and other such influential people, both past and present, who also start(ed) each day by doing their craft. How come those who write at night never receive that kind of love and admiration? How come no one ever writes about the gamblers, swindlers, and malcontents who also got up early? Nighttime writers are seen as coming to their craft much too late in the day – after many long hours at work, after the kids and other home obligations – at a time when morning writers are much too spent for anything so important as the composing of deathless prose. Nighttime writers aren’t celebrated. They aren’t seen to be giving up anything other than perhaps a night at the club or a binge session of Netflix, neither of which should they partake in anyway. When praising famous daytime writers, people conveniently forget that those who lived prior to the modern era probably had to write when they did since the artificial lighting options of the past, depending on the era, ranged from monstrously expensive for the average person to blindness-inducing in the long term besides. Early-morning writers and nighttime writers should have no problems relating to each other; surely, the very difference between the two is just a matter of semantics to begin with, for often enough, the night ends and the new day begins and the nighttime writer is just getting a second wind. A nighttime writer’s embracing of darkness – which is no less dark than that of the early morning – isn’t applauded, however. 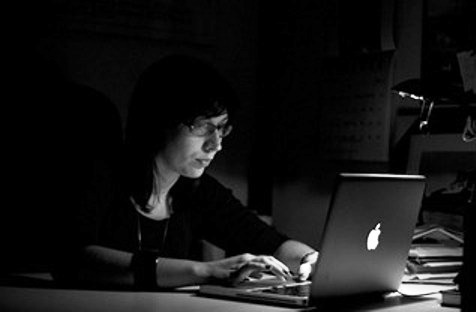 Night writers are seen as putting their craft last – as not really living the artistic ideal, but perhaps coming very close indeed to the vampiric ideal, subsisting on strong coffee, weak cigarettes, and broken dreams, bent over his/her desk with incredibly poor posture, scratching or tapping away furtively as if at work on a traitor’s confession. I am, perhaps, exaggerating with that last bit. But I am a nighttime writer and honestly feel I couldn’t be any other way without a drastic change to my lifestyle. I see writing as something to look forward to over the course of the day. It’s how I unwind after a long day at work, and my best ideas come both a) when I’ve had the day to mull them over while doing other things and b) when I translate these ideas to actual words in a slightly tired state. Slightly tired, not bone-weary, it’s-so-early-I-don’t-think-this-is-good-for-my-heart, cold-as-death-in-winter tired. Ultimately, the time of day one writes doesn’t matter so long as the writing actually occurs. When do you write and/or do your other creative work: daytime or nighttime? Why does that time work best for you? Let me know in the comments. This entry was posted in Writing and tagged Daytime writers, Inspiration, Nighttime writers, Work-life balance, Writing habits, Writing inspiration. Bookmark the permalink. I don’t know. The image of the drinking, smoking all-night writer holds a noir romanticism for me. Provided such individual lives in black and white. I actually write whenever. Day, night. whenever I have time, limited distractions, and motivation. I suppose if I could write fiction for a living, I’d write during the day. That image appeals to me as well, although I myself don’t fit it that well since I don’t smoke or drink coffee and hardly ever drink booze (I once tried to follow Hemingway’s advice to write drunk and edit sober and just wound up passing out on the couch). My writing time is scheduled, so there’s never any “whenever” about it. If I ever started working at night instead of during normal office hours, I obviously start writing in the daytime, but still, those hours would be scheduled because I’m just a scheduling kind of gal. If I wrote for a living, I think I’d still do nighttimes, but just stay up later (that’s what I did during the year I was unemployed). I basically have all day – but if I don’t get up, turn on the computer, block the internet, and get going by 7 or 8, I get nothing written that day. Physical reasons: a chronic illness which, IF managed correctly, will allow my energy to peak around 9 or 10 am (after first nap), and let all that stuff that’s been percolating in the ol’ noggin’ organize itself into words on the page. Any other time is hopeless. BEFORE first nap, I need to put the stuff into my brain I will be organizing later. It’s crazy, rigid – and works for me. More often than not. Despite your illness, it sounds like you get up pretty early if you’re already writing by 7; much earlier than I’d willingly rise if I had all day. But perhaps “willingly” is the operative word. I’m glad you’ve figured out a system that works for you. It’s not easy working with limited resources, be those resources physical, instrumental, or intangible. If you have a peak time of day, and you know that if you don’t get moving and use it, you won’t have it again for 24 hours, you move. Or you don’t, and you learn that you need to move the next time it comes around. I either quit this (which is ridiculous – I finished the writing), or finish it. Hmmm. Have to go get a few fears out of my head and into the Fear Journal (where they stop bothering me). If something is important enough to you, you make the necessary sacrifices. “Quit or finish” is a good mantra for all writers. See: there’s a hierarchy! Of all things I’m a mid afternoon writer. Sure, I can write in the morning, and when I was doing my PhD I regularly got up, put my robe on, grabbed a cup of coffee and there I went until lunch time. But in truth, I actually concentrate best mid afternoon until dark. Which is really a dumb time to write because dinner prep, walk the dog etc. sigh. When I was doing my Master’s, I’d work on my thesis in the morning and my first (incomplete, shelved) novel at night. That was a lot of days with nothing but writing! But it never occurred to me to switch that schedule around, so I think I’m a night-time creative writer through and through. My mid-afternoon energy is kind of inconsistent – I often experience the mid-afternoon lull and am better off using that time to do something that doesn’t require as much thinking. Not so much look down upon, but fail to celebrate and admire us the way daytime writers (especially the early morning ones) are. I just want someone to love me too! I agree, we do spend a lot of time worrying how other’s do it, perhaps because we’re all still waiting for our official Writer’s Club cards in the mail – acknowledgement that yes, you are a writer and yes, you’re doing it right! I wouldn’t last on 4 hours a night either. I actually work very hard to prioritize a good night’s sleep every night, which some may view as indulgent but in my mind is the best asset I can offer anyone (my alertness and uncompromised ability to think through and solve problems). Oh, yes, that official writers club card! haha. It’s very elusive. Just this weekend I had a small meltdown. We raise goats and needed to buy a buckling from another farm. When we first started 4 years ago I read this amazing, lyrical, wonderful book about a writer who herded dairy goats (Goatsong by Brad Kessler). I’d been leaning toward Nubian goats and the book solidified my decision. So this weekend we called a farm off Craig’s List and it happened to be Brad Kessler on the other end! My husband talked to him but right away I realized it was HIM–a real, published successful author!!!! After the phone call my husband was all impressed with Brad’s awards etc. I was like: What about little old me? Do you think he’s a better writer? Do you think he’s a better person?! Not the right answer. 🙂 I said: Okay, give me a minute. I’m having a prideful writer moment. He laughed and went back to washing his car. What a great story – I can totally empathize with how you felt. It’s no easy thing to meet an idol and deal with the inevitable comparisons to oneself that result. And oh dear, what a typical, well-meaning yet slightly oblivious husband response! I think you are impressive too, Adrienne, because you both create and raise goats – how diversified is that! I work best at night. The stillness and the quiet helps me figure out where i need to go it seems. Not that I’m not occasionally productive in the morning. On a good day I like to do two sustained sessions, one late morning to early afternoon, one after dark until midnight or beyond. But late afternoon is inevitably a wasteland for me. Just the worst. Weird how that works. My energy and alertness closely follows my eating schedule: immediately after eating, I’m great; an hour or so after eating, I’m dragging. I think part of why nighttime works best for me is because once dinner is over, I don’t eat again until morning, so as the hours stretch on towards midnight and beyond, my thinking gets sharper again. I honestly can’t raise the enthusiasm after a day at work. Morning for me, but always hoping for high days and holidays to really crack on. Evenings I run/slouch/read/sleep. But you’re right about old-time writers with the natural light dying so early in the wintertime – much easier to write early in the day. On weekends and holidays, I almost never write, for those are my opportunities to get caught up on all the (other) fun things (e.g. shopping, socializing, watching TV) I didn’t get to do during the weekday evenings when I was writing.